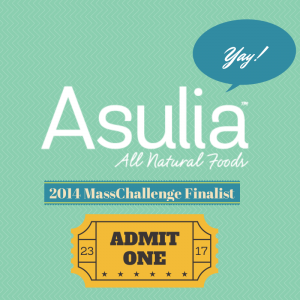 I’m beyond ecstatic to share that Asulia has been selected as one of 128 startups for the 2014 MassChallenge program! It’s an honor to be invited to be part of such an amazing community of startups and entrepreneurs. Being a finalist means free office space for our marketing intern and I to work from, access to amazing resources, and, most importantly, the opportunity to work alongside fellow entrepreneurs who are just as crazy and in love with what they do as I am. It’s so encouraging to be chosen to be a MassChallenge finalist. Startup life is a rollercoaster of the highest of the highs and the lowest of the lows. This milestone validates that my ideas for merging my obsession with vegetables (#vod) and desire to help girls is working, slowly but surely. MassChallenge will help us accelerate this process, so we can make a bigger impact quicker. We’ve come a long way from the beginning, where I knew very little about the food industry, to selling our fusion vegan dumplings in Whole Foods, Formaggio Kitchen SE, Volante Farms and more today. And we’ve only just begun! Follow us on our journey on Facebook, Twitter and Instagram for more news! You have done a remarkable job in bringing everything together to get your business going. I am proud to have been working with you as a SCORE mentor. Warmest congrats! So happy to hear it! Thanks so much! I’ve appreciated your willingness to share your business wisdom. Thanks Barbara! Working on some things for Room to Read. Looking forward to firming up details and sharing soon.